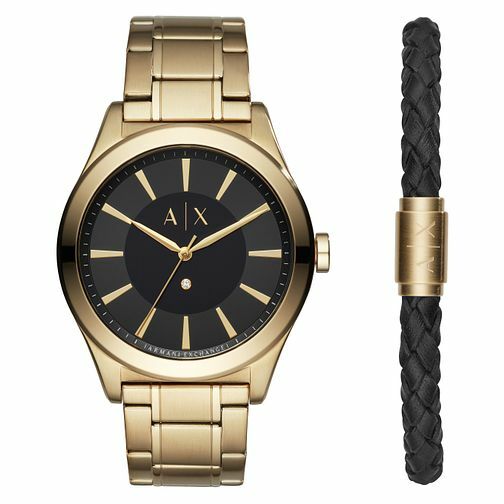 This Armani Exchange Nico men's watch features a black textured dial with gold baton hour markers and a stunning single crystal set in a gold surround. These details paired with a brushed-and-polished gold-tone case and bracelet strap, makes this timepiece perfectly suited to the modern man, ideal for any event and occasion. Complete the look with the handsome woven black leather rope bracelet with a brushed gold tone fixing engraved with the iconic A|X logo. Armani Exchange Men's Gold Plated Watch & Bracelet Set is rated 4.9 out of 5 by 8. Rated 5 out of 5 by Anonymous from Amazing It is a good quality watch that amazing to look at.